Wheel Bolts & Nuts are available in grade 4.6, 8.8, 10.9 and ASTM194 & 193 grade B7 & 2H. We are a professionally managed organization and have gained a reputed position in the national as well as international markets by providing an extensive range of Metal Nuts, Metal Bolts, Metal Washers, Threaded Rods, Strut Fittings, Automotive Fasteners and Anchor Fasteners. 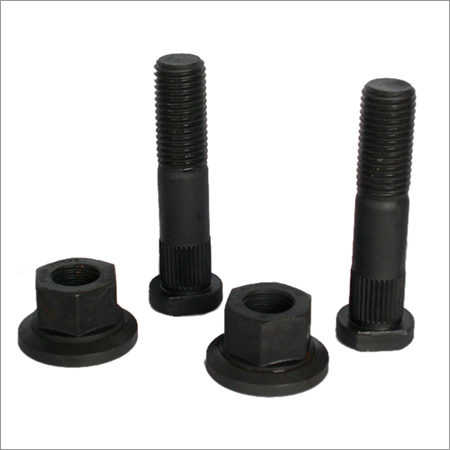 We are leading manufacturer and exporter of Metal Nuts, Rod Coupling Nuts, Square Nuts, Lock Nuts, Coupling Nuts, Flange Nuts, Metal Bolts, Hex Bolts, Foundation Bolts. Flange Bolts. Metal Washers, Flat Washers, Plain Washers, Spring Washers, Threaded Rods, Threaded Bars, Double Ended Studs, Fully Threaded Studs, Low Carbon Steel Threaded Rods, Strut Fittings, Strut Channels, Channel Spring Nuts, No Spring Channel Nut, Automotive Fasteners, Wheel Bolts & Nuts, Wheel Nuts, Hex Nuts, Anchor Fasteners all type. These are are manufactured using quality-tested material and appreciated for their high strength, durability, dimensional accuracy and wear & tear resistance. Our range of Industrial Fasteners is of assured quality and is tested at every level of production in order to ensure its conformation with international quality standards. In addition to this, we also hold third party inspection for our range from reliable names based in India as well as abroad. Being customer friendly, we ensure to carry out our range in accordance with the client's requirements. Owing to these factors, we have been able to build a vast client base all across the globe.